First Bride For a Century. When Miss Alison Fenn, of Alston Court, Nayland, near Colchester, was married at St James's Church, Nayland, on Saturday, she was the first bride from Alston Court for 106 years. The previous wedding to take place from Alston Court was on May 19, 1840, when her great grandmother, Maria Alston, was married to Thomas Harold Fenn, whose family in those days lived at Stourbank, Nayland. The bride is the daughter of Col Alston Fenn, DSO, (late of the Sherwood Foresters), and Mrs Fenn, of Alston Court, and her groom was Major Wray Redman, of the Sherwood Foresters, son of Mr and Mrs G. G. Redman, of West Lodge, Upham, Southampton. The Sherwood Foresters were well represented at the wedding, and the guests included Lieutenant Colonel Sir Harry Willcox (Colonel of the Regiment) and Lady Willcox. Given away by her father, the bride wore a gown of white georgette, with pearl girdle, and carried a shower bouquet of pink roses. The bridesmaids, Miss Angela Fenn (sister of the bride) and Miss Margaret Robinson, wore hydrangea blue taffeta dresses, and carried bouquets of pale roses, and Master Christopher Davies (cousin of the bride) was page. The duties of best man were carried out by Major Richard Fleming, of the Black Watch. The officiating clergyman was the vicar of Nayland (Canon W. J. Wright), and the hens were Praise My Soul the King of Heaven, May the Grace of Christ Our Saviour, and Fill Thou My Life, and the Psalm, Put Thou My Trust in the Lord. Following the reception at Alston Court, Major and Mrs Redman left for a holiday, the first part of which will be spent at Flemings Hall, Bedingfield, Suffolk (lent by Mr and Mrs T. J. Morris), and the remaining in Ireland. The brides travelling dress was a red coat and frock, with hat to match. I love this picture of Wray he looks so happy and so cheeky, all ready to share one of his jokes and dressed in his BEST, kept together with binder twine. It was so lovely seeing you both again. I am seriously thinking of coming on a visit (to NZ) in the next year or 2000! That would be so lovely to see you in your place. Very much love"
Alison was very active in her community,involved in conservation and holistic health practice. With Wray they planted their 70 acre property, Nutley Farm, in wild flowers. Tragically Alison died in a motor vehicle accident, forestalling her dreams. 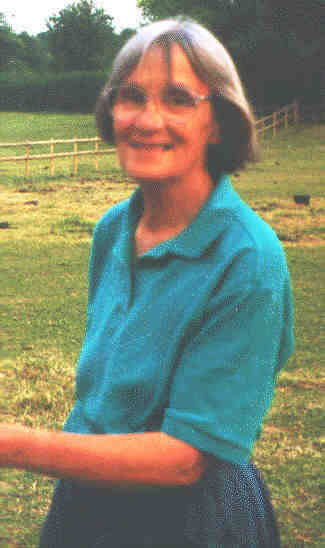 Redman Alison died in a car accident on 5th of December 1998 aged 74 years. Much loved by many. Burial at Broughton Cemetery at 2 p.m. on Friday 11th of December. Service of thanksgiving at St Mary's Church, Broughton, Hants at 2:30 p.m. Family flowers only but donations if desired to the Hampshire Wildlife Trust c/o A.H. Cheater Funeral Directors Romsey Hampshire.